The Computer Centre on the main floor is also available for working and learning activities, suited for larger groups. Twelve computer workstations are available, each outfitted with Intel Duo Core CPU, 4GB memory computers that use Windows 7, 8.1, and 10 operating systems. High-speed ADSL connects users to the Internet. Three scanners, one laser colour printer, a web camera, headsets, and microphones are also available for use. For groups requiring a computer projector to show presentations or lessons, arrangements can be made. 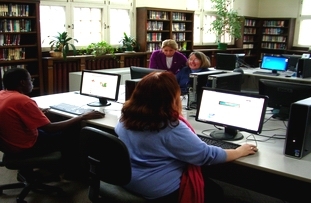 During regular library hours, the Computer Centre is reserved for public use but is available for workshops and rentals after library hours: Mondays and Wednesdays after 8 pm, Tuesdays, Thursdays, and Fridays after 6 pm. Please inquire about weekend availability.